« Brand New Baby eCard for Brand New Babies! Not everybody in the office at JibJab is a human being. 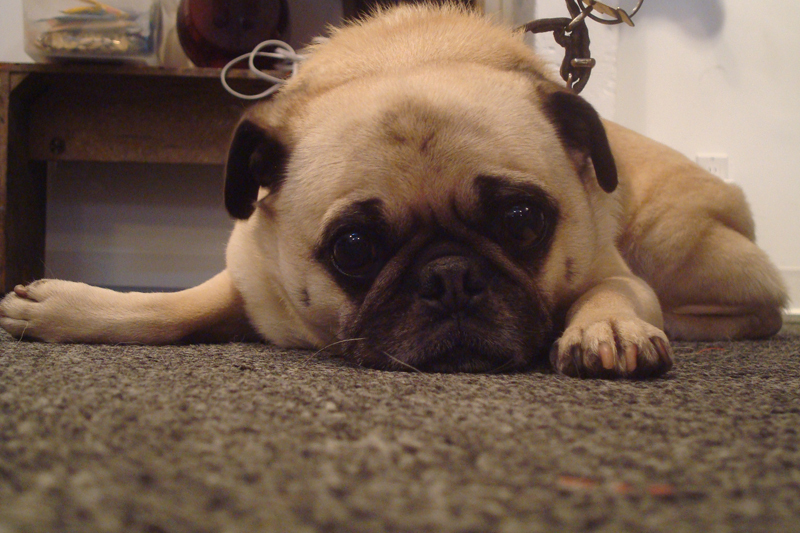 Case-in-point, our beloved office pug Sammie. Sammie is a staple here at JibJab, he loves attention and if let loose will visit every desk in the office, run around in a few circles, then find the nearest trashcan and try to eat everything inside. It is for this reason that when Sammie enters a room, you’ll see people start to put their trash cans out of his reach. Sammie’s talents reach far and wide, he’s even an accomplished actor! Check out some of Sammie’s greatest work here and here on our site. This blog is for you, dog! This entry was written by paulhanges and posted on March 12, 2009 at 5:16 pm and filed under Uncategorized. Bookmark the permalink. Follow any comments here with the RSS feed for this post. Post a comment or leave a trackback: Trackback URL. You forgot to mention that the wonderful Tim Gillons also had a cameo in that first video — he’s so damn handsome.